Data center hardware spending remain soft, but that could empower enterprise buyers who see the benefits of better performance and control of their own gear. The overall server market remains stagnant, with little help from enterprise buyers. Revenue was up 6.3% in the second quarter from a year ago, propped up by cloud service providers and Intel’s new Skylake processors, according to the Worldwide Quarterly Server Tracker from analyst firm IDC. Gartner’s server revenue numbers (2.8% year-on-year growth) also show no boost from enterprise purchases; instead citing data center infrastructure build-outs in China and hyperscale data center purchases of original design manufacturer gear. 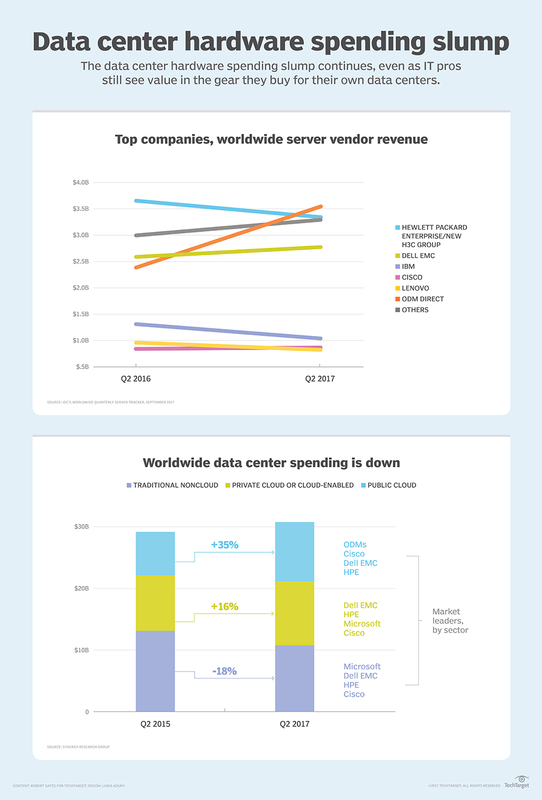 Synergy Research Group draws an even more sober picture of data center hardware spending: revenue from traditional non-cloud data center hardware and software — servers, operating systems, storage, networking and virtualization software – has sunk 18% during the past two years. With no end in sight to slumping enterprise server demand, pressure continues to build on server vendors, and that spells an upside for enterprise IT buyers, said John Dinsdale, chief analyst and research director at Synergy. “Vendors will be facing increased competition for a somewhat smaller pool of dollars, which could result in more aggressive pricing and also sales and support teams that are working really hard to keep clients happy,” he said. Consider Tyreworld, a tire wholesaler in Dortmund, Germany, which runs its website in the cloud but keeps its IT infrastructure in its own data center. To keep up with growth in its dropshipping business, this summer the company considered several options to speed up its Microsoft SQL database, including a hardware upgrade or a move to one of two cloud computing data centers in Germany, said Manuel Hanke, IT manager at Tyreworld. He chose the former: DataCore MaxParallel for Microsoft SQL Server on top of new Huawei servers. A move to the cloud with comparable hardware, would have cost 800 euros per month, while the servers and software were a one-time charge of 7,500 euros, he said. Some specific enterprise workloads still spark interest in data center hardware spending. On-premises data centers are still important for data sovereignty, or workloads with strict service level agreements such as block storage. New servers often go toward analytics workloads – not the traditional next-morning inventory reports, but more modern high IOps, high frequency, low latency workloads such as real-time analytics that benefit from multi-core compute. In-memory databases also are still largely on-premises because of concern about available bandwidth, latency and network speed. Many companies need a foothold in both worlds – cloud for test and development, but in-house infrastructure to run production workloads. Server vendors are keen to deliver from both ends, as seen with Hewlett Packard’s recent acquisition of Cloud Technology Partners. And some companies, like Tyreworld, don’t want to deal with an external data center and are happy to own their IT infrastructure. “Even if you have a dynamic business, as we do, an in house solution works very well,” Hanke said.